Trump defender and legal scholar Alan Dershowitz weighed in on the Kavanaugh vote in a Fox News op-ed published late Thursday. Harvard Law School scholar Alan Dershowitz weighed in on the controversy raging around Friday’s expected vote by the Senate Judiciary Committee regarding the confirmation of Trump’s nominee to the Supreme Court, Brett Kavanaugh, in an op-ed piece published by Fox News Thursday evening. “The Senate Judiciary Committee needs to slow down and postpone its vote on the nomination of Judge Brett Kavanaugh to the Supreme Court until the FBI can investigate accusations of sexual misconduct leveled against him by three women,” Dershowitz began. If Kavanaugh actually did the things Ford alleges – something he vehemently denied again Thursday – he might honestly not remember the events that Ford described, especially if he was as drunk as she says he was. Right now, the testimony of the two witnesses has created a credibility tie. Such ties are best resolved by looking at corroborating evidence. At the moment, Kavanaugh has the better of the corroborating evidence, especially the statements by the other people who were allegedly at the party where Ford claims Kavanaugh attacked her. But that could change after a full and thorough FBI investigation and further testimony. In the end, a tough choice will have to be made by the Senate and it is likely it will be made based largely on partisan considerations. This is not America’s finest moment. 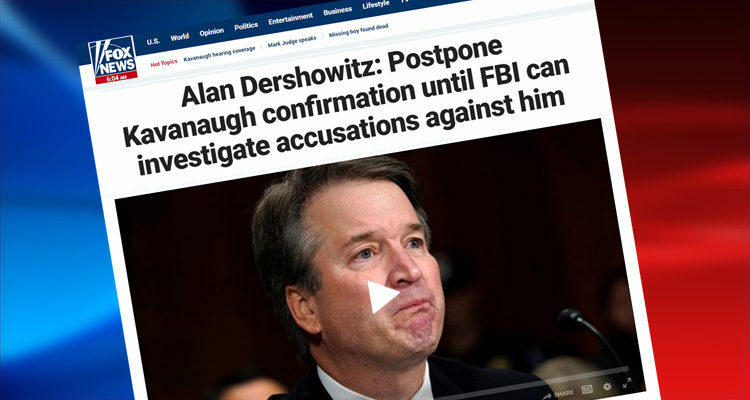 In related news, CNN reported a few hours after the Dershowitz article that they had obtained a copy of a letter from the American Bar Association (ABA) to Senate Judiciary Chairman Chuck Grassley and ranking Democrat Dianne Feinstein calling on them to halt the confirmation vote for Brett Kavanaugh until the FBI has time to complete an investigation into assault allegations lodged against the embattled Supreme Court nominee. In a strongly worded letter obtained by CNN Thursday, the organization said it is making the extraordinary request “because of the ABA’s respect for the rule of law and due process under law,” siding with concerns voiced by Senate Democrats since Christine Blasey Ford’s decades-old allegations became public. “The basic principles that underscore the Senate’s constitutional duty of advice and consent on federal judicial nominees require nothing less than a careful examination of the accusations and facts by the FBI,” said Robert Carlson, president of the American Bar Association.